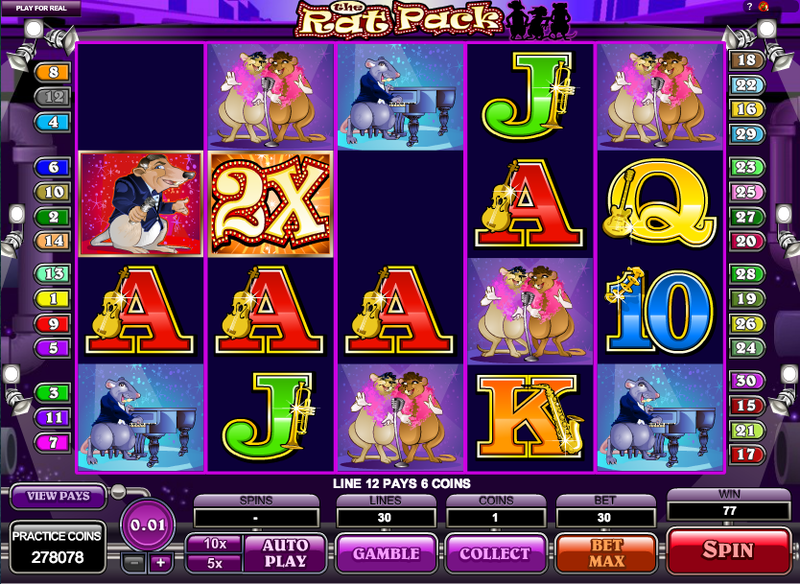 The Rat Pack is an all new slots game from Microgaming that we know you're all going to love. The Rat Pack is a slot from the minds at Microgaming and yes it is what it looks like, this is a slot based off the world famous rat pack only interpreted a little more literally. We don’t need to spend too much time talking about how much of an amazing concept this is for a slot. The light-hearted nature of slots like The Rat Pack is the reason why so many of us choose to play online slot games to begin with. Be prepared to have all of your wildest dreams come true. Never before have you seen Frank Sinatra, Sammy Davis Jr and Dean Martin in a style like this. Graphics in The Rat Pack lends itself to a rather cartoonish style (although it’s quite a daft theme so it could only really work in this style). Yes there is an uptown swing to the games soundtrack and yes there is also a variety of added features to change up the games play style with every spin. Players have the opportunity to win up to 30,000 credits max. 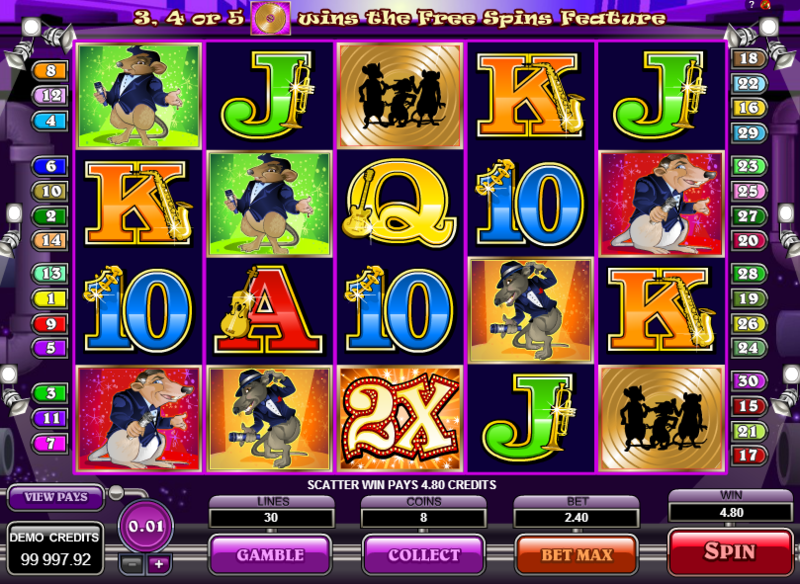 The Rat Pack is a 5 reel slot that is played over 30 pay-lines. Opening it’s doors in 1994, Microgaming is one of the most progressive game companies in the entire world. After the release of their Viper software in 2002, the company saw itself sail to new heights to both players and their peers alike. Over the past 10 years Microgaming has paid out more than 100 million in jackpots since it’s inception. Now that’s impressive. You can find out more about the developers range of other games here at https://www.easyslots.com online casino. Before players spin these reels, they should decide on how they wish to proceed. Setting the bets for each pay-line will set them up for the rest of the slot. From there it is up to the player to utilise the many different features at their disposal to perform for the rat pack themselves. Wilds, scatters, free spins are all some of the ways in which players can win big. Bets can be placed from as little as 0.01 per spin to as much as 75.00 per spin. It goes without saying, but there is a lot on offer here in terms of gameplay. There is also a wild multiplier symbol (its name is exactly what it does) is represented by a big 2X symbol. Matching this symbol will double any payout of any combination. Vinyl records serves as The Rat Pack’s scatter symbol, matching 3 or more of these symbols will unlock the free games feature which in turn, opens the door for even more scores and even higher cash pay-outs. If you liked The Rat Pack you might also like Secrets of the Stones online slots game.